This dark red bacon-flavored frosting is a dream come true. 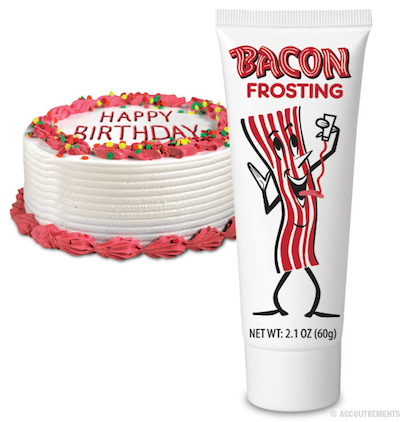 Keep a tube of Bacon Frosting on hand to finish off a dessert masterpiece, add sweet smoky delight to any dish, or indulge in a delicious squirt right onto your tongue (like we do). Rumor has it the astronauts have been asking for bacon in a tube for decades! Each tube is 5" tall by 2" wide and holds 2.1 oz (60g) of frosting. Cake not included.